When I started my first website I had no idea that a www URL was better than a non www URL (sometimes called a root or naked URL). In fact, I had no idea that both options even existed. Unfortunately, my first website’s URL by default was a naked URL. Most “experts” will tell you that there is no difference, it’s just a matter of preference. It does make a difference! 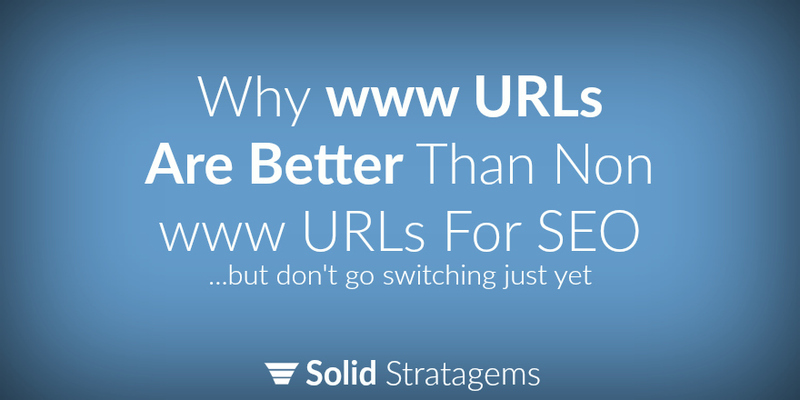 www URLs are better for SEO! …but don’t go switching just yet. Website performance and speed is playing a growing role in SEO. www URLs have at least two advantages over naked URL’s. CNAME Records: Some hosting providers strongly recommend against naked domains. One reason for this is that www URLs allow the hosting provider the extra flexibility of redirecting traffic from a failing server using DNS CNAME records. You can learn more about this over at Heroku. Cookies: Among the best practices for website developers is serving static content from a cookieless domain (often a subdomain of the website, e.g. static.domain.com). If you are using a www URL you are actually using a subdomain as your canonical domain (www.domain.com is a subdomain of domain.com) and cookies will not get sent to other subdomains (e.g. static.domain.com). If you are using a naked domain (non-www) as your canonical domain, the cookies may get sent to all your subdomains, including the subdomain used for static content). In short, a naked canonical domain can prevent one from creating a cookieless subdomain. If you listen to a hundred “SEO” experts you’ll get a hundred different opinions. If you’re smart you’ll stop trying to learn from the “experts” and start learning from the brands that are at the top of search engines for the most valuable keywords and phrases. In the case of www vs. non-www, you can take note from the biggest and best search engines. Google, Yahoo and Bing all use the www. That should say enough by itself. Admittedly there is no direct SEO difference in branding your site as www.domain.com or just domain.com. That said, when people see a www they immediately think website. I’m just assuming that branding your website with a www is much more effective than without it. Of course, you could always brand your website with a www even if the canonical URL is naked (I did this with my first website), but doing so may lead to more www links. Not good. If you’re starting a website from scratch I highly recommend starting with a www canonical domain. But what if you’re not starting from scratch? Based on the above reasons websites with a naked URL should switch to a www right? Perhaps much worse than wrong. If your website has already begun to gain natural links to you naked canonical URL the last thing you want to do is change your canonical URL. All those links would pass through the redirect and you would lose a portion of that precious PageRank you’ve spent so much time and effort earning. You already made the decision (whether intentional or not), and it’s time to move forward. Like me, you can always make the better choice on your next website. So you’re bummed because you or your client chose a naked URL. And you know switching to a www URL is a no go. But, you want the full benefit of all links pointing to your site. Including the ones with your pointing to your non-canonical www URL. So after you have specified your preferred domain Google will consider the non-canonical version the same as the canonical. I think this means that there is a good chance that links with or without the www will point directly to your “preferred” (aka canonical) domain and there is a good chance the PageRank passes directly to the “preferred” domain as well. This is the best solution I’ve found (other than choosing a www to begin with). Here’s instructions on specifying your preferred domain from Google’s page on setting a preferred domain. Why Is My Website Still Showing Up In Search Results Without the https://? In Google’s search console page on how to Use Canonical URLs, they include a section about how they prefer https over HTTP for canonical URLs. In this section they help developers troubleshoot why Google may choose to make the http rather than the https the canonical URL for a website.